Nothing like a nice little Oreana storm to go out and ride in! 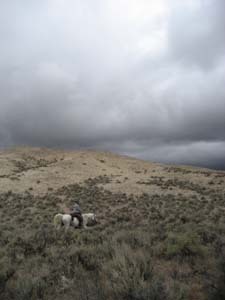 A cold front blew in during the day, strong chilly wind dropping the temperature 40 degrees (from 95* to 55*), whispy gray rain clouds hanging off the Owyhee front range... but that's as far as they got all day. The wind let up a bit toward evening, making it tempting for a ride, and I said “Aw, it's not going to rain,” so we braved the cold (I loved it, Steph put on extra layers!) and headed out southwest toward the mountains. 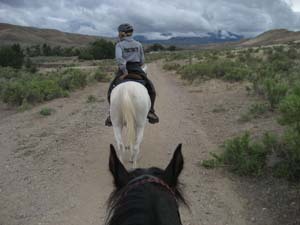 We climbed up on the north mesa overlooking Pickett Creek, on three fast-walking horses (Steph on Mac, John on Hoss, I rode Rhett this time). The three weren't walking fast heading out; they probably thought staying home and gorging on hay with their buddies to keep warm was a better idea. We've been this way before, scoping out possible future ride trails: heading west on one side of a mesa, back east on the other side of it overlooking the next drainage, climbing down into the drainage and back up onto the next mesa, west up that side, east down the other side, climb down then back up onto the next mesa. In fact we did this one night, and saw 5 full-moon rises! By the time we returned on top of the first mesa and dropped down into the drainage, it seemed that suddenly some dark clouds had gathered with some intent over our left shoulders and behind us. 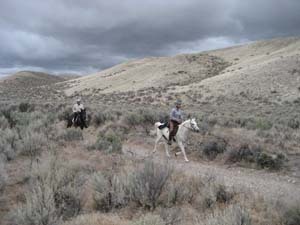 As we continued east down the wash that would meet Bates Creek, the clouds to the left got bigger, closer, and blacker. The clouds over the mountains behind us got thicker, starting to veil them, and I looked up, and we seemed to have been quickly covered all over with heavy clouds. John was trying to talk us into riding back west up the rim overlooking Bates Creek - riiiiiiight! I kept asking Steph and John, “Do you hear thunder?” They kept saying no, but I didn't entirely trust them. 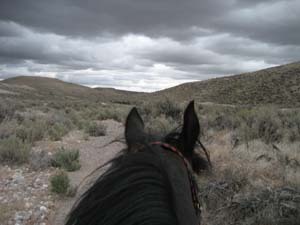 Because, what would I do if it WAS thundering, gallop home in a panic through the rocky sagebrush-encrusted, gopher hole-pocked sand wash? At least Steph said No, she didn't want to head back up the next mesa INTO these dark clouds, but she didn't sound nervous at all. I was sitting on needles, expecting any minute for what always happens to me: to hear a big BOOM, meaning too late, I'm already IN the storm, stuck here, AGAIN, middle of a big lightning storm, nowhere to go, nowhere to shelter, with that massive adrenaline rush that ties my stomach in knots and reminds me once again, I am utterly helpless and insignificant in the face of such a terrific force of Nature, and I have not made out my will. I wasn't gripping my reins but I was just waiting, WAITING, for that first boom. I wonder if my face was turning a shade of desert moonlight-white. The dark clouds did tint the desert with a whole new pretty palette of colors, which I was able to appreciate even though I was on the edge of switching into near-panic mode, and we wound through some very tall sagebrush (lightning rods?) into the middle of Bates Creek – which up here was still a dry wash, passing a beautiful lone juniper tree (a bigger lightning rod??). We walked back through and along the wash, past the neighbor's place, onto the road. The blackness of the clouds dimmed, but bled out into the rest of the sky, making the whole of it a dark gray, as if it were after sunset. Now behind us, the mountains were completely obscured by a gray curtain. Rain was definitely coming! We trotted a little bit, getting back to our driveway – passing 2 nighthawks perched on the fence rail, who appeared completely unbothered by us – when it just started spitting big raindrops. 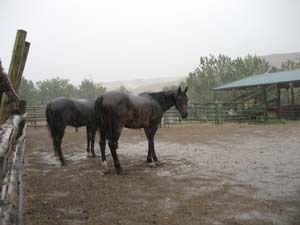 We trotted faster back into the yard when it started pelting down. 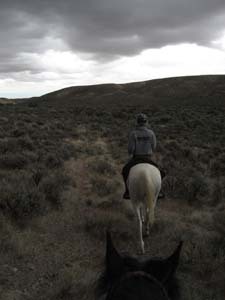 We hurriedly hopped off the horses and unsaddled them; Rhett was turning tail to the rain even as I jumped off. We ran the horses into their pen – only Mac ran right back out because he wanted his bucket of oats! Steph gave it to him and he stood there eating out of his bucket as if it were a sunny day in Nebraska (where he came from, the Rushcreek Ranch), while we humans sheltered from the downpour under the roof of the tackroom, and the other 6 horses hunkered down, butts to the rain, heads down to the ground. Mac kept eating, facing the rain, oblivious to it, happily eating, and we watched sheets of rain dumping from those thick clouds. Everything had turned a light rain-gray. It dumped and poured and pelted, a good long heavy rain, the best rain we've had here since January, and not a peep of thunder or lightning that could have rightfully accompanied the storm. Heck, I could have kept riding back up the mesa after all!